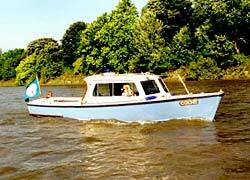 Based on the River Thames at Goring, we are the longest established British firm dealing solely with electric boats and electric drive systems, and we have been at the forefront of many developments in this field. Our customers include the three major navigation authorities - British Waterways, the Environment Agency, and the Broads Authority - together with commercial operators, canal societies, and of course a huge family of private boat owners. We pride ourselves on our service, and always aim to supply the customer with the best equipment for their needs. Over the years we have developed many new products, and set world records for electric boat performance. Come to the Thames Electric Launch Company and you will be in good hands. Move your mouse over one of the headings at the top of the screen. A menu will appear, from which you can select a product to view.